Recommended citation: Sakata N, Yoshimatsu G, Kodama S. Islet Autotransplantations for Total Pancreatectomy. OBM Transplantation 2019;3(2):14; doi:10.21926/obm.transplant.1902059. Total pancreatectomy (TP) is performed for not only malignant pancreatic diseases but also benign disease such as chronic pancreatitis or pancreatic injury. However, because this surgery involves removal of the whole pancreas, both exocrine and endocrine pancreatic functions are abolished, significantly impairing the nutritional statuses of patients as well as having other detrimental outcomes. Thus, especially in benign cases additional treatment to recover endocrine function is recommended, as permanent endocrine dysfunction significantly decreases quality of life. Historically, islet and pancreas allotransplantations have been performed to recover endocrine function in severely diabetic patients. In TP patients, islet autotransplantation (IATx) can be performed in patients with benign pancreatic disease with absent endocrine function after removal of the pancreas. Autotransplantation rescues pancreatic function and prevents the onset of secondary diabetes mellitus. In this review article, we describe the current status of TP with IATx and include one of our own cases. Total pancreatectomy (TP) is a surgical treatment for malignant pancreatic diseases such as pancreatic cancer and intraductal papillary mucinous neoplasm. In the 20th century, TP was once considered as a “lethal surgery” because it caused unexpected deaths from excessive surgical stress. However, today, TP is considered an effective and safe surgery with low mortality rates (less than 2 %), and is commonly selected as a therapeutic option for the malignant pancreatic diseases . TP can also be performed for benign pancreatic disease like chronic pancreatitis (CP) or pancreatic injury, usually as a last therapeutic resort . However, surgery can abolish pancreatic exo- and endocrine functions, significantly impairing the nutritional condition of the patients postoperatively. In particular, diabetes mellitus (DM) can result from TP, and is classified as type 3c DM (pancreatogenic diabetes). The type 3c DM is characterized by endocrine instability due to the absence of both insulin and glucagon, which works to the decrease and increase blood glucose, respectively . In patients who develop this, controlling blood glucose can be quite difficult despite treatment with insulin. Moreover, endocrine dysfunction can cause non-alcoholic fatty liver disease and non- alcoholic steatohepatitis . In contrast, exocrine dysfunction resulting from TP leads to the malnutrition and body weight loss from steatorrhea, diarrhea, and vitamin deficiency . Impairment of quality of life (QOL) owing to the permanent abolishment of exo- and endocrine pancreatic functions can be significant in TP patients; because benign diseases do not generally influence poor prognosis, these patients have to suffer from decreased QOL throughout their lives. Fortunately, exocrine function can be recovered by the use of pancrelipase; however, additional treatments for the recovery of the endocrine function are needed. 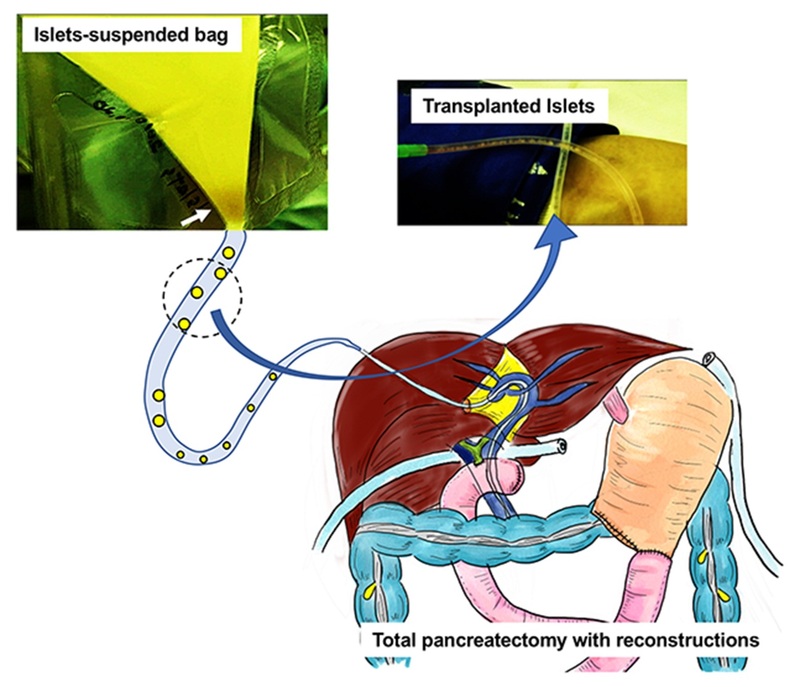 In this paper, we review the procedure of islet autotransplantation (IATx), characterized by transplantation of islets acquired from the resected self-pancreas. IATx is a representative treatment for rescuing endocrine function, and enables stabilization of blood glucose in patients who receive TP. In this review article, we examine the current status of the TP with IATx. Before commentary of IATx, we must first understand pancreas and islet transplantations (PTx and ITx). In general, “transplantation” means “allotransplantation.” Allotransplantation is different from autotransplantation in various aspects, including indications and methodology (summarized later). Both PTx and ITx aim to improve or cure the unstable control of the blood glucose in severe DM patients, especially in type 1 DM . The first PTx was performed on a 28-year-old woman at the University of Minnesota in 1966 . PTx was considered as an experimental treatment until the 1980s, and institutions performing PTx were limited in the United States and Europe during this period . A turning points for PTx came with the introduction of novel immunosuppressants, including tacrolimus and mycophenolate mofetil, and development of cold preservation of organs using University of Wisconsin (UW) solution during the 1980s to 1990s. These innovations, combined with the evolution of surgical technique, improved the therapeutic outcomes of PTx, and the number of transplants gradually increased . According to a recent report of the United Network for Organ Sharing (UNOS) and the International Pancreas Transplant Registry (IPTR), over 48,000 PTxs were performed worldwide . PTx is classified into three categories based on its combination with kidney transplantation: 1) simultaneous pancreas-kidney transplant (SPK), 2) pancreas after kidney transplant (PAK), and 3) pancreatic transplant alone (PTA). Among them, SPK is the most frequently performed procedure (74 %), followed by PAK (17 %) and PTA (9 %). The graft function is the best in SPK, for which graft survival is superior to that in PAK and PAT (89.1 % vs. 84.4 % in PAK, 82.7 % in PAT at 1 year after transplantation). Moreover, there has been recent improvement in graft survival in SPK (82.2 % in 2010-2014 vs. 79.4 % in 2005-2009, p = 0.01; at 3 years after transplantation) and PAK (75.4 % vs. 67.3 %, p = 0.002) . Today, PTx, especially SPK, is considered a preferable surgery for curing T1DM with an increased likelihood of long graft survival. The procedure can be summarized in three parts as: removal of donor pancreas, bench surgery and transplantation. The removal of the pancreatic graft is performed by simultaneous hepatopancreatectomy, simultaneous removal of pancreas and kidney after hepatectomy, or sequential removal of liver, pancreas and kidney. In case of hepatopancreatectomy after removal of small intestine graft, the pancreatic graft is removed by transection of hepatic artery at gastroduodenal and common hepatic arteries for hepatectomy, transections of the greater omentum and short gastric arteries at the border of gastric wall, transection of gastric antrum, isolation of the pancreas and spleen from retroperitoneum, and resection of the aorta. The separation of the liver and pancreas is done on back table. Case of simultaneous removal of pancreas and kidney after hepatectomy are performed by the same method of simultaneous hepatopancreatectomy, except for transection of the common bile duct. Finally, en bloc pancreatic graft is performed with the duodenum, spleen, vascular stumps of superior mesenteric and splenic arteries, and portal vein removed. The pancreatic graft is moved to the back table, and next, reduction of the duodenum, reconstruction of the Y graft (connection between iliac artery from the donor and the superior mesenteric and splenic arteries), and mobilization of the portal vein are performed. The arterial reconstruction consists of anastomoses between the external iliac artery and the superior mesenteric artery, and between the internal iliac artery and the splenic artery, respectively. The portal vein is extended using the common iliac vein in many cases, and bifurcation of the internal and external iliac veins is used for reconstructions of splenic vein and superior mesenteric vein in case in which the portal vein is cut at the bifurcation of splenic and superior mesenteric veins. In case of SPK, pancreas is intraperitoneally transplanted at the right iliac fossa, and kidney is extraperitoneally transplanted at the left iliac fossa. The drainage route of the pancreatic juice is selected from the bladder and enteric routes; the former is characterized by side-to-side duodenovesical anastomosis, and the latter is characterized by side-to-side duodenojejunal anastomosis. While the bladder route was often used previously, the enteric route is usually chosen in many institutions [8,11]. ITx is a cellular replacement therapy characterized by an infusion of isolated islets from a donor pancreas via portal vein into liver in clinical settings. Clinical ITx was first used at the University of Minnesota in 1974 , and the first report of a patient who received ITx and achieved normoglycemia without insulin usage was in 1989 . However, the therapeutic effects of ITX were not satisfactory in the 1990s. According to the newsletter of International Islet Transplant Registry (ITR) in 2001, the rates of graft survival (C-peptide ≥ 0.5 ng/mL) and insulin independence rates at 1 year after transplantation was 41 % and 14 %, respectively (http://www.med.uni-giessen.de/itr/newsletter/no_9/news_9.pdf). In 2000, a group at the University of Alberta in Canada found that all seven patients with type 1 DM who received ITx achieved insulin independence, and three of the seven patients stayed this way for over a year. They modified the methodology of ITx by enhancing immunosuppression by induction of novel immunosuppressants, including sirolimus (mTOR inhibitor), daclizumab (anti-CD25 antibody) and tacrolimus (a calcineurin inhibitor), and by acquiring sufficient islet volume for normoglycemia with multiple transplantations . Their methodology was named the “Edmonton Protocol”. In 2005, the Alberta group reported their long-term outcomes of ITx, and showed that rates of graft survival and insulin independence at 1 year after transplantation were approximately 90 % and 60 %, respectively. In contrast, the insulin independent rate at 5 years after transplantation decreased significantly to 7.5 % . After this report, many institutions worldwide have attempted to improve the long-term outcome of ITx. For example, the Minnesota group assessed the outcomes of eight patients who received ITx from single donor using modified Edmonton Protocol with induction therapies of daclizumab to antithymocyte globulin (ATG) and TNFα inhibitor etanercept; the patients achieved insulin independence in all cases . According to the tenth annual report of the Collaborative Islet Transplant Registry (CITR) in 2015, rates of insulin independence, graft survival (C-peptide ≥ 0.3 mg/mL), achievement of normoglycemia (fasting blood glucose levels 60 – 140 mg/dL) and hemoglobin A1c (HbA1c) ≤ 7.0 % at 5 years after transplantation in patients receiving islet transplant alone (without kidney transplantation) are approximately 40 %, 70 %, 80 %, and 70 %, respectively. For these data, T-cell depletion medications, such as ATG, TNFα inhibitors for induction immunosuppression, mTOR inhibitors and calcineurin inhibitors for maintenance immunosuppression were used and resulted in more than 325,000 islet equivalents (IEQs; 150 µm-sized islet = 1 IEQ) of transplanted islets and more than 35 years recipient age (https://citregistry.org/system/files/10AR_Scientific_Summary.pdf). Moreover, phase 3 trials of human islet transplantation in type 1 DM patients, which were performed in North America from 2008 to 2014, were complicated by severe hypoglycemia (CIT-07). This trial revealed that 87.5 % of cases at 1 year and 71 % at 2 years after ITx achieved HbA1c <7.0% and avoided severe hypoglycemic events . ITx disadvantages include the impossibility of acquiring 100 % pure islets from the donor pancreas and difficulty of engraftment from tissue hypoxia, initial inflammation, or rejection. ITx advantages include minimum surgical stress and faster recovery after transplantation and retransplantation for achieving normoglycemia . The transplant efficacy of ITx is considered to be inferior to that of PTx, however, recent outcomes of ITx improved dramatically, become closer to that of PTx. The first step of ITx is pancreas procurement for islet isolation. When the donor pancreas is removed, the duodenum and spleen are removed from the pancreas on back table. Next, a catheter is inserted into the major pancreatic duct to infuse a preservation solution, such as UW solution or modified Kyoto (MK) solution, for protection of the duct . The pancreas is then packed into the preservation container with oxygenated perflurocarbon (PFC) and UW solution [20,21]. The pancreas is then transferred to the specified institution for islet isolation. The process of islet isolation has three steps: perfusion, digestion, and purification. The pancreas is placed into a safety cabinet, decontaminated using iodine and antibiotics solutions, and then, injected with collagenase solution via the major pancreatic duct . For collagenase, a blend of liberase mammalian tissue-free collagenase (liberase MTF) and thermolysin, a neutral protease (NP) (liberase MTF C/T), or collagenase NB1, supplemented with NP (collagenase NB1/NP) is mainly used . Collagenase is continuously injected at lower pressure (60-80 mmHg) for the first 5 minutes, followed by high pressure (160-180 mmHg) until the pancreas is fully distended .The distended pancreas is cut into 7-10 pieces, and loaded into the Ricordi’s digestion chamber in a circulation tubing system warmed to 37 °C. After loading the collagenase solution into the system, the pancreas is digested by collagenase circulation with gentle shaking of the Ricordi’s chamber. The digested tissue is sampled and checked under a microscope, and when 50 % of the free islets are found in the samples, the digestion is stopped. Then, digested tissue is collected, washed by centrifuge, and suspended into a single conical tube . Purification of islets from the digested tissue is performed by COBE2991, a cell processor using a continuous density gradient using Ficoll® solution, etc. . The process of ITx is performed under X-ray and ultrasonography examinations. First, a catheter is inserted into portal vein using ultrasonography via percutaneous transhepatic route under local anaesthesia. After confirming the position of the catheter by portography, the islets-suspended bag with heparin is connected to the catheter, and islets are dropped with monitoring portal pressure. After completion of the islet infusion, the entry tract is plugged with a haemostatic sealant, and the catheter is removed . In general, surgical treatments for CP are performed on patients with refractory pain despite of abstinences from alcohol, smoking, analgesics, and endoscopic treatment . The surgical treatments are classified into two categories: 1) drainage, including Partington and Frey procedures, and 2) resection, including pancretoduodenectomy (PD) and distal pancreatectomy (DP). The appropriate surgery is selected depending on the status of the patients and the severity of the lesion . The Frey procedure, a lateral pancreatojejunostomy with coring-out of the pancreatic head region, has been mainly performed in Japan. The useful therapeutic effects of the Frey procedure have been shown by various studies. For example, Negi and colleagues showed that 75% of patients who received the Frey procedure acquired partial and complete pain relief, and only 7% developed DM after surgery. The median follow-up was 6.4 years . The Gestic group showed useful effects of the Frey procedure in pain relief (91% of patients experienced complete resolution of pain after a median postoperative span of 77 months) . Our previous study also showed similar results; 92.9% and 77.0% of patients who received the Frey procedure experienced improvement in pain at 1 and 3 years after surgery, respectively. The rate of new-onset DM and worsening DM was 10% 3 years after the surgery . According to recent guidelines for treating CP in Japan, TP should be considered in patients with inflammatory changes in the entire pancreas, have uncontrollable pain despite use of narcotics, and can adhere to certain lifestyle changes including abstinence from alcohol, smoking, or other drugs (https://doi.org/10.2169/naika.105.2001). Based on these findings, TP with IATx can be a therapeutic option for CP, but it is considered a therapy of last resort in Japan. In contrast, there are some institutions that aggressively promote TP with IATx, mainly in the United States. Since the first IATx was performed at the University of Minnesota in the 1970s, approximately 800 patients, most of them with CP, received IATx [32,33] (https://citregistry.org/system/files/1st_AR_Auto.pdf). IATx is a therapy considered for the recovery of endocrine function in patients receiving TP. According to the report of 400 TP patients with IATx at the University of Minnesota, 85 % and 77 % of patients at 1 year and 2 years, respectively, experienced pain relief, and half of the patients did not require the use of analgesics. For endocrine function, 28 % did not require insulin treatment, and 49 % were able to successfully manage blood glucose using insulin 1 year after the surgery. These ratios were maintained at 3 years after surgery (30 % and 33 %, respectively). Indeed, 77 % and 63 % of patients at 1 year and 3 years, respectively, had experienced endocrine functions after IATx . The Minnesota group later accumulated over 500 cases and therapeutic outcomes, and revealed that the rates of pain relief and engraftment of autologous islets were 92.6 % and 87.5 % at 1 year after TP with IATx . Moreover, a systematic review using five clinical studies about IATx for treatment of CP indicated that reduction in narcotics necessity was achieved by IATx in two studies. In addition, 46%-64% of patients at 5 years and 28 % at 10 years after the treatment did not require the use of narcotics . Though rejection due to acquired immunity is not induced by IATx, many of the islet grafts fail to engraft because of tissue hypoxia and innate immune response early after transplantation. Thus, it is difficult to recover endocrine function completely, despite undergoing IATx. Acquiring as many islets from the resected whole pancreas as possible is important for fully the therapeutic effect of IATx. According to a study of previously mentioned Minnesota group, the transplantation of more than 5,000 IEQs/ kg body weight increased the percentage of insulin-free to 72 % at 3 years after TP with IATx, while only 12 % of the patients who received transplantation of fewer than 2,500 IEQs / kg body weight was free from insulin . The complications of TP with IATx can be categorized by procedure. IATx-related complications include portal vein embolization and portal hypertension, and both result from an infusion of islets into the portal vein. The occurrence rate of portal vein embolization is approximately 5 %, and fortunately, this complication is generally curable by anticoagulant therapy [36,37,38,39]. However, there are a few cases of patients who need surgical embolectomy . In contrast, portal hypertension is seen more frequently in IATx patients rather than allogeneic ITx, because the tissue volume tends to be increased in IATx ; traditionally, the purification of islets has been performed for IATx . Matsumoto and colleagues indicated that there was a positive correlation between the tissue volume and portal pressure; therefore, they recommended that purification should be performed even in cases of IATx, when tissue volumes after digestion were >15 mL . In contrast, the Minnesota group recommended a reduction of tissue volume to <0.25 mL*body weight (kg) to prevent portal venous thrombosis . The main complication of IATx is bleeding, which is induced by portal hypertension or heparinization . The major complication related to TP is known to be delayed gastric empty (DGE). According to a study at the Johns Hopkins Hospital, DGE was seen in 35% of patients who underwent TP with IATx . Postoperative cholangitis is also a known complication of TP and can impair the transplanted islets via oxidative stress . The other indications for TP with IATx are pancreatic injury  and pancreatic arteriovenous malformation (AVM) , a rare disease. Patients with AVM, who experience repeated bleeding and episodes of pancreatitis, might require TP with IATx . TP with IATx is mainly performed to relieve the uncontrollable pain from CP. However, many CP patients in Japan are alcoholics, and do not need narcotics. Drainage or resection of the lesion causing pain is performed in patients requiring intervention. Therefore, TP with IATx may not be necessary for many Japanese CP patients. In contrast, there are over 200 patients with hereditary pancreatitis who may be at an increased risk of pancreatic cancer in Japan . Some of these patients might need TP to relieve uncontrollable pain and improve nutrition, and thus, IATx can be available therapy to support endocrine function . Overall, most CP patients do not require TP with IATx, but some patients exist who may uniquely benefit from this procedure in Japan. In these cases, this treatment should be promoted. In 2011, clinical TP with IATx was performed in a 59-years-old man with pancreatic AVM, acute pancreatitis (AP), and bleeding at Tohoku University in Japan . After this patient’s procedure, several islet transplant institutions have performed this treatment in Japan (no publication at present). Mainly, there are two differences in the TP procedure for malignant pancreatic tumors and IATx compared with benign diseases: 1) the necessity of lymph node dissection, and 2) the time of ligation of the main artery, which flows into the pancreas. While lymph node dissection is essential for curative operations for malignant pancreatic tumors, there is no need for IATx. For ligation of the main artery, ligations of the gastroduodenal and splenic arteries are performed in the period immediately before completion of the pancreatectomy to shorten the warm ischemic time in IATx; in contrast, the arteries are ligated as early as possible to avoid unnecessary bleeding in malignant tumors. A high skills level is required for curative surgery for malignant tumors, but TP for IATx patients requires additional skills, since the volume of bleeding is often higher increased from preserving blood flow and presence of inflammatory changes in the pancreas. These findings generally occur in cases of CP, making the identification of the anatomy difficult. Here, we describe the procedure of TP with IATx as it was performed during the first case in Japan. It should be noted that for TP, en-bloc resection of the whole pancreas is preferable for IATx in general. Here, however, we divided the process into two steps: DP and PD procedures. The procedure was planned in detail before surgery to diminish unnecessary bleeding and to shorten the operative time by performing islet isolation from distal pancreas and PD at the same time. The resected pancreas was soaked in cold ET-K solution and transported to the cell processing center in Tohoku University. A series of reconstructions of cholangiojejunostomy, gastrojejunostomy, and closure of the abdomen was performed during islet isolation from the head and body of the pancreas. The islet infusion catheter was inserted into the portal vein via teres hepatis and fixed with elastic thread. The islets were then infused via the catheter into portal vein while monitoring portal pressure and blood glucose in the same manner as in islet allotransplantation (Figure 1). Pressure of the portal vein before transplantation was 8 mmHg, and pressure during transplantation was mildly increased (11–12 mmHg). Total time of transplantation was 85 minutes. The procedure was performed under general anaesthesia, and the patient recovered from the anaesthesia without trouble or complications correlating with the transplant procedure. During the perioperative period, the patient received continuous intensive insulin therapy with continuous injection of low molecular weight heparin and high total parenteral nutrition while fasting for resting transplanted islets. Continuous insulin therapy was changed to multiple daily insulin injections 1-2 weeks after transplantation, when the vascular network was established. 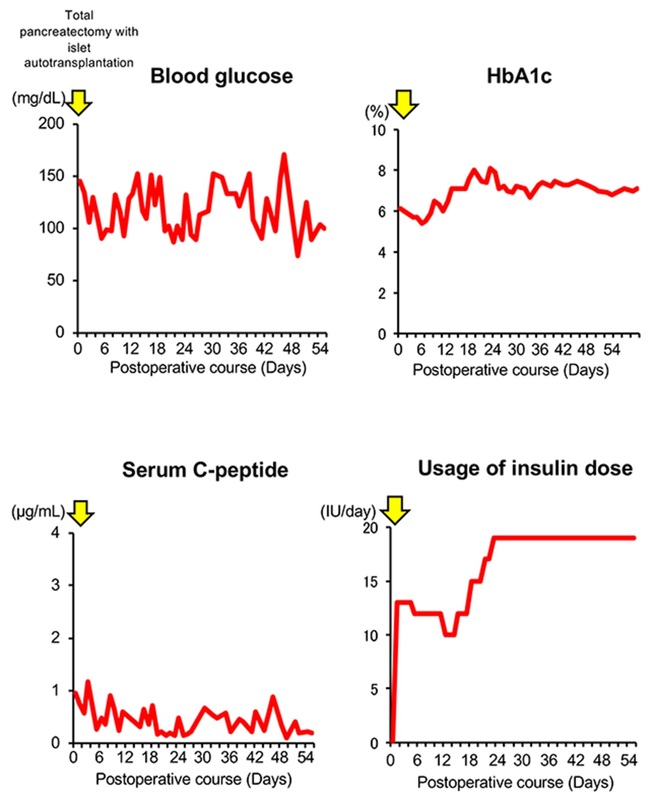 Discharge of the patient was permitted after establishing the daily doses and patterns of insulin usage, and after the patient received education on insulin self-administration. Figure 1 Scheme of total pancreatectomy with islet autotransplantation. Over 5 years have passed since transplantation in our case. At present, the patient has nearly stable blood glucose control and maintains a HbA1c level at baseline with the use of additional insulin, with minimal hypoglycemic symptoms and no hypoglycemic shock (Figure 2). The symptoms of exocrine dysfunction, like pancreatic steatorrhea, can be prevented by use of pancrelipase. We performed TP with IATx for four cases total and succeeded in engrafting transplanted islets in two of the four patients (verified by serum C-peptide measurements and maintenance of stable blood glucose at a stable insulin dose). Finally, we summarize the differences between ITx and IATx. The differences are evident in both the indication and procedure technique. ITx is chosen for severe DM patients, especially type 1 DM patients, who have poor and unstable blood glucose level despite intensive insulin therapy, including insulin pump therapy. In contrast, IATx should be chosen for patients who need rescuing of their endocrine function from pancreatogenic diabetes after TP. Regarding procedure technique, ITx is characterized by the infusion of islets via a percutaneous transhepatic route under local anesthesia in an x-ray room. IATx can be performed following TP in the operating room or the x-ray room in cases for which the surgery and islet isolation can be completed at the same institution. If the cell processing center is far from the hospital or the postoperative conditions of the patient cannot permit IATx following TP on the same day, the transplantation is performed later by a method similar to ITx. The transplantation route can be ensured by intraoperative cannulation of the catheter into the portal vein via the teres hepatis or superior mesenteric vein in IATx. Regarding islet isolation, while the purification process is necessary for ITx because of the reduction of extra-islet cellular components, including acinar and ductal cells, this process can be omitted in IATx, except in cases in which the tissue volume is too high (Table 1). Figure 2 The postoperative course of a case who received total pancreatectomy with islet autotransplantation. Table 1 Summary of the differences between ITx and IATx. Intraportal infusion via branch of portal vein including superior mesenteric vein and teres hepatis under general analysis. In this paper, we review TP with IATx and discuss our experiences. It is critical that IATx is performed to recover the endocrine function lost by TP. Though IATx is not a therapy that can lead to complete recovery of absent endocrine function, it can facilitate the adequate blood glucose control with insulin usage. Furthermore, IATx improves the prognosis of patients who have undergone TP with increased postoperative QOL. Thus, IATx should be promoted as a useful additional therapy for patients receiving TP for benign pancreatic diseases. We thank Katrina Krogh, MD, from Edanz Group (www.edanzediting.com/ac) for editing a draft of this manuscript. NS designed this review plan and wrote the first draft. GY and SK revised the draft. This study was supported by a Challenging Research (Exploratory) (17K19692, NS), and a Grant-in-Aid for Scientific Research (B) (26293294, SK) from the Ministry of Education, Culture, Sports, Science and Technology of Japan. Kelly WD, Lillehei RC, Merkel FK, Idezuki Y, Goetz FC. Allotransplantation of the pancreas and duodenum along with the kidney in diabetic nephropathy. Surgery. 1967; 61: 827-837. Najarian JS, Sutherland DE, Matas AJ, Steffes MW, Simmons RL, Goetz FC. Human islet transplantation: A preliminary report. Transplant Proc. 1977; 9: 233-236. Sutherland DE, Radosevich DM, Bellin MD, Hering BJ, Beilman GJ, Dunn TB, et al. Total pancreatectomy and islet autotransplantation for chronic pancreatitis. J Am Coll Surg. 2012; 214: 409-424; discussion 424-406. Farney AC, Najarian JS, Nakhleh RE, Lloveras G, Field MJ, Gores PF, et al. Autotransplantation of dispersed pancreatic islet tissue combined with total or near-total pancreatectomy for treatment of chronic pancreatitis. Surgery. 1991; 110: 427-437; discussion 437-429.